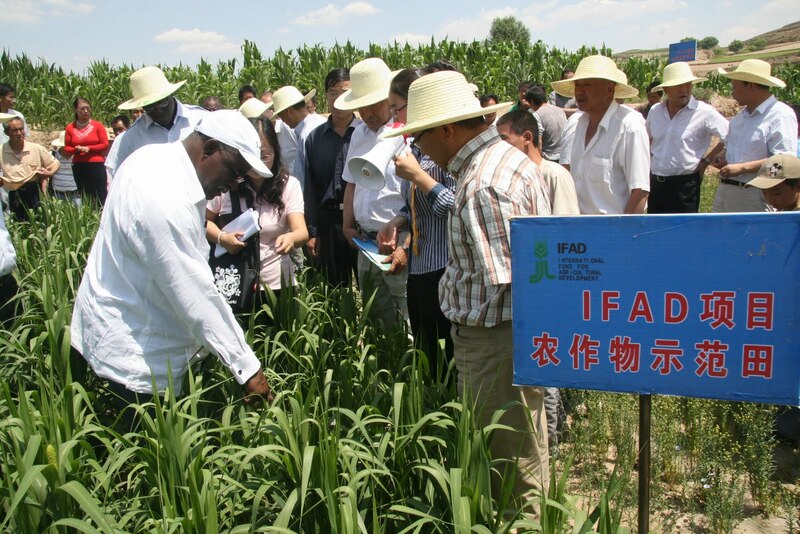 On 18 July, after a two-hour flight from Beijing, the IFAD delegation headed by the President of IFAD Kanayo F. Nwanze, landed in Lanzhou airport in the afternoon of 18 July. Upon arrival in Lanzhou, the delegation met with the provincial led by Vice Governor Ze Bazu for a briefing on the programme. The Vice Governor made a presentation on the overall situation of Gansu province and the status of the implementation and achievements of the IFAD supported South-Gansu Poverty Reduction Programme cofinanced by the Government of China and the World Food Programme (WFP). According to the local government, this programme is contributing to improve livelihood services for about 1.1 million poor farmers who live in an ecologically fragile and arid area where annual precipitation is merely about 300 mm each year. In the evenin g, the IFAD delegation was received by the Governor of Gansu Province Liu Weiping. Both sides reiterated the partnership in poverty reduction and agricultural and rural development in the province. The programme covers 10 counties: Huining in Baiyin Prefecture, Longxi, Tongwei, Weiyuan and Zhangxian in Dingxi Prefecture and Dongxiang, Guanhe, Hezheng, Jishishan and Linxia in Linxia Autonomous Prefecture. It would take more than a month to visit the entire area covered by the programme. With limited time at our disposal, the Huining County was chosen for a visit. After listening to various briefing on the project, I could not wait to see the achievements of the project and meet with the beneficiaries to hear from them how this project has changed their life for the better. Early in the morning of 19 July, a quick breakfast and check-out, we got in the mini-bus for a one-and-half hour ride. The first stop was a visit to the clinic built in thanks to this programme in Zhang Cheng Pu village. Through the programme, 63 years old Dr Li Lai Chang was trained to acquire new health care knowledge. The health care pamphlets were also distributed to villagers. This modern rural cli nic has a room where Dr Li visits his patients and another room with two beds for seriously ill patients. When talking to Dr Li Lai Chang, he told us that he has been working as the village health doctor for more than 40 years, but thanks to the new clinic supported by IFAD, he can visit up 5,000 patients a year now. From the clinic we moved to visit one household in the same vil lage. The beneficiary brought us in his kitchen to show us that today he can cook and obtain electricity thanks to the biogas obtained from two pigs and two cows. In the courtyard of his house, he has a drinking water tank of 38 m3 or 38,000 litres. He collects rain water in the tank and with a simple solar dish made with small pieces of a mirror, he can boil water. It is simple technology and with all the sun Africa has, the African can use this simple and easy-to-make solar dish without cutting the trees for cooking. In 15 minutes, you have hot water and cannot touch the pot with hand. This simple technology can be transferred to rural areas in Africa that can help to preserve the trees. More than 80 biogas to cook and to get electricity, and 160 drinking water tanks were built in the village because of the programme. Before the programme, he told us, we would have to travel far from the village to get water. My quality of life is improving since I joined the programme, he continued. Our annual income was less than CNY 4per cent of Zhang Cheng Pu villagers use ,000 but today we have around CNY 18,000 he concluded. From Zhang Cheng Pu, we moved to Jiao He village. Along the remote mountain road, could be seen beautiful kilometres of terraces where the farmers grow a variety of crops, including fodder crops t o feed the animals for their livestock businesses. The IFAD supported programme has terraced 5,000 hectares of sloped land and constructed 4,905 underground irrigation tanks. Seventy-five kilometres of irrigation canals support food security when initially the Gansu Province has assisted with the terraces of 10 to 15 levels and is committed to terrace about 74 per cent of cultivable sloped land (around 3.1 million hectares) by 2012. Looking over those terraces the President of IFAD asked about rainfall in the area. The answer was 300 mm annual. This is very low when you compare it to Sahel, which has an average of 400 mm of annual rainfall. This arid land in Gansu is securing food for the farmers of our project areas here in China, I think to myself, when at the same time in the Sahel region and Horn of Africa there is a famine. If the rural farmers can make it, I think that Sahel, Horn of Africa and many African countries must learn from Chinese’s experiences. The technology that farmers use in Gansu is simple and cost less. 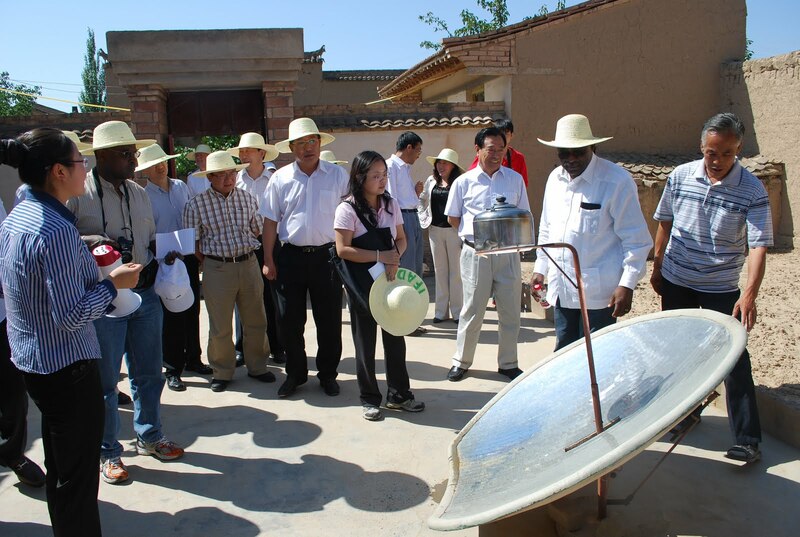 IFAD has an important role to work with China on South-South Cooperation in transferring those simple technologies that I saw in Gansu over a few days to help African countries to feed themselves, even in arid and poor-land regions. Finally, we arrived in Jiao He village. The local project staff briefed the delegation on the various activities a nd the components of the programme. We were informed that the programme is benefiting 54 per cent of women in the selected areas. It was also impressive to see how the number of the households participating in the programme evolved over time in terms of moving out of poverty over four years (2006-2010). When targeting the beneficiaries in 2005, the farmers were classified in four groups: A, B1, B2 and C. The households in groups C and B2 were the most vulnerable and considered as target audiences. In 2005, among the 600 households in the programme areas, 220 were in group C (which is the lowest category of the poorest of the poor) and 230 in B2 (which is the category before the C one) while group A, which is the category of the rich among the poor, has only 50 households. From 2006 until 2010, the number of poor households in the C group decreased while the group in category A increased. The A group of 50 households increased to 105. This is an indicator that the poorest household conditions are becoming better and they are moving out of the poverty. We were also informed that the grain production has also increased in the programme areas. In 2005 the average per capita grain production increased from 246 kg to 328 kg in 2010. The group of villagers of Jiao He were waiting for the IFAD delegation at the main square. It was a true festival. The women beneficiaries of the programme warmly welcome the IFAD team with gifts of the art crafts. You can see that the poverty has a dignity. The youngest ben eficiaries of the programme, the students from a local school that was built as part of the programme, were also represented. One of their representatives, a 10-year-old girl with perfect English, introduced herself to the President and thanked IFAD for the new school. She joined her classmates in singing a song of friendship after her introduction. From the square, the delegation visited Li Guo Chin, one beneficiary. He received the delegation with a gift of boiled potatoes, fruits and tea. Mr Li joined the programme in 2007 when his annual income was about CNY 4, 4000 (USD$620). In 2008, he received a loan of CNY 10,000 (USD$1,550) for a livestock project. Today he has 100 goats and 40 cows and his annual income increas ed drastically to around CNY 80,000 (USD$12,500). He is now leading a livestock association and gives cows or goats to other villagers to raise. After, he pulls together all of the cows or goats raised by the villagers to sell for a profit. The profits are then divided among the members of the association based on how many cows or goats each one raised. In two years, Li Guo Chin who earned less than USD$2 per day in 2006 is earning now USD$35 per day. This is a real challenge for the world leaders who set 15 years to half the number of people leaving in poverty. With the right investment and right ideas, Li Guo Chin in two years moved out from under extreme poverty. If Li can do it, many other rural farmers in developing countries can also stand and say “yes I can. Yes I want to move out of poverty”. 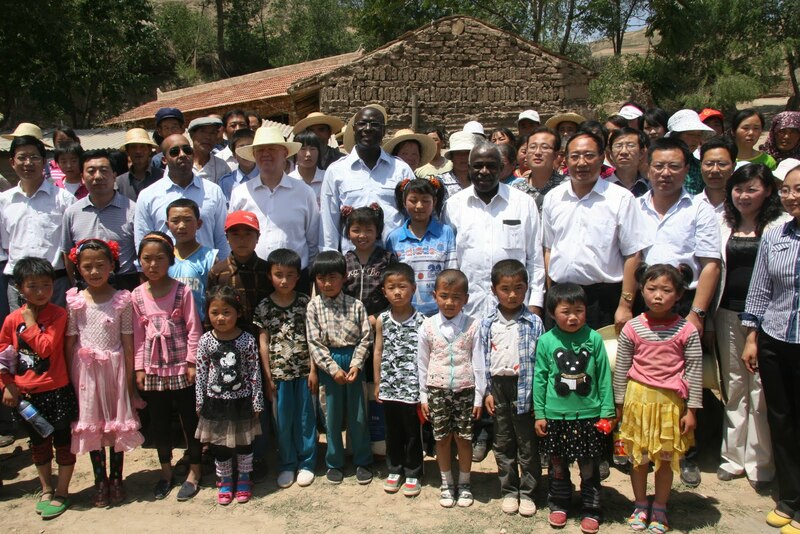 What I saw in South Gansu shows how resilient and committed the people themselves are; and how effective the programme is. 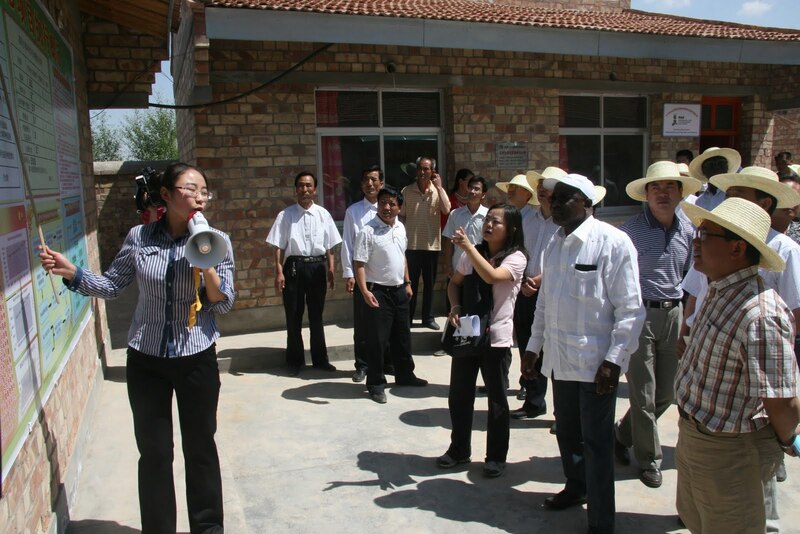 It also shows how local leadership and government’s coordinated action, early investment in agriculture and continued support of the Chinese government to the rural South Gansu farmers; the use of appropriate technology; government and external investment; link with market ; hard work of farmers and the integrated approach of the programme (social, economic development and environment protection) play a crucial role and make the difference. We do not need 15 years to move people out from under poverty. But the people from the developing world, and in particular African countries, have a lot to learn from China’s experience. Commitment of government and more importantly commitment and diligence from the beneficiaries, are the ways to quickly move people out of poverty. We should all sit up and take notice of these examples now before it is too late. According to the information received from the provincial programme management team, the results in Huining County are similar in other nine counties. In Dongxiang County, Ma Taguo a farmer in Beizhuangwan village joined the project in 2008. He was trained and received the virus-free potato and planted the new variety in small piece of his land. He harvested 750 kg more potato on this small piece of land than the normal variety he planted and his income has increased by 10 per cent. Now Ma has decided to plant the new variety of potato on most of his land. For many farmers like Ma Taguo, the new variety of potato is helping to increase their food production as well as their income. Xie Shaowu, a farmer in Xiaozhai village in Linxia County, increased his production and his income by growing maize with the mulching technology introduced by the South-Gansu Poverty Reduction Programme. These days, the famine in Horn of Africa is on all the screens of the TV and top news of various newspapers around the world. If the dry Gansu Province can feed its rural people, how come Sahel and Horn of Africa can’t?